Updated Wednesday August 22, 2018 by Whitby Minor Baseball Association. 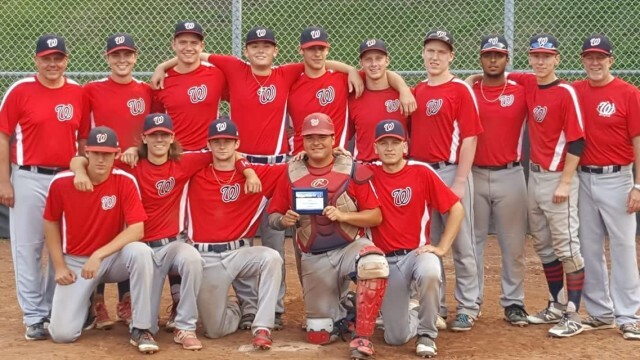 Capping off a strong season as one of the youngest teams in the league, the Whitby Chiefs 21U team (Junior Men, age 21 and under) knocked off two regular season powerhouses on the final weekend to capture the 2018 Toronto Baseball Association (TBA) championship. Whitby had earned a spot in the final four tournament on August 11 with a comeback 2-1 series win over the High Park Braves, including a 12-9 clinching win at Christie Pits. After a heavy rains forced postponement on Friday, August 17, the four-team TBA championship was pushed to a single-elimination format on Sunday, August 19. In the semi-final, Whitby trailed regular season champion Etobicoke Rangers early, but battled back to equalize and take a 7-4 lead into the bottom of the seventh and final inning. With two out and the lead trimmed to 7-5, Etobicoke had runners at second and third. A base hit to the outfield scored one run from third, but the Rangers’ tying runner who tried to score from second base was thrown out at the plate to secure a dramatic 7-6 upset win. Whitby faced the Newmarket Hawks (who had defeated the Leaside Leafs in the other semi-final) for the championship. The Chiefs took an early 2-0 lead, but the Hawks scored a run in each of the first three innings for a 3-2 advantage. Whitby cashed in the tying run in the fifth, scoring a runner from third on a double play. Then in an intense sixth inning, the game turned in Whitby’s favour as the Chiefs hammered out a pair of clutch hits for a 6-3 lead. The Chiefs certainly saved the best for last. In the final inning of the season, Whitby’s bats exploded as they cranked out and incredible 12 runs. They would blank Newmarket in the bottom of the inning for an 18-3 championship win. The victory marks the Whitby Minor Baseball Association’s first-ever championship in the TBA Junior loop.